In this post, let’s learn all about TravelHerd invoices! 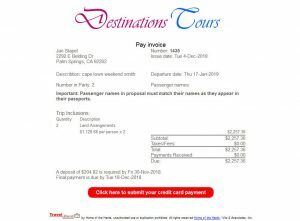 TravelHerd invoices are issued in html email format. TravelHerd subscribing companies have the option to use the standard format html invoice included with their subscription or request that a custom-designed invoice be programmed for their exclusive use. In either case, all TravelHerd invoices come complete with a great set of extremely useful features. Invoices in TravelHerd may be issued for proposals (not yet under deposit) and reservations (under deposit) to the booking agent; if the booking agent is a travel agent, TravelHerd will create a travel agent invoice complete with commission detail, while a direct consumer booking agent will have a direct consumer invoice with no commission detail created for them. 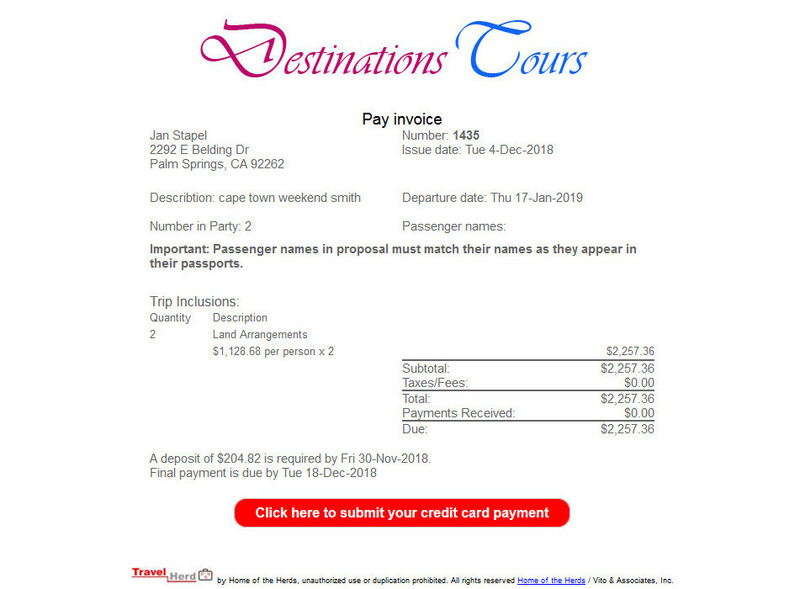 There is also an option to create a client invoice with no commission detail for proposals and reservations made by travel agents, which can be sent to the travel agent’s client. TravelHerd offers a choice of recipient options for invoices. Invoices are issued and emailed while within the TravelHerd proposal or reservation to the travel agent or direct consumer who made the reservation, to the reservation staff agent who created the reservation or to a third party’s email address. The reservation staff agent may select any combination of these potential invoice recipients. TravelHerd’s invoice module has been enhanced with an option to issue an email client calendar event when issuing an invoice. The calendar event with deposit due date or final payment due date can be issued along with an invoice to the client (travel agent or direct consumer), the reservation staff agent and/or a third party. TravelHerd has teamed up with Authorize.net for secure on-line credit card processing. All credit card data entry screens are securely hosted by Authorize.net for enhanced security and confidence. An option to include a payment button for deposit or final payment, via secure credit card processing, in the TravelHerd invoice can be added by the reservation staff agent when the invoice is issued. The invoice recipient selects the payment button to make a payment and enters the credit card information on the Authorize.net server via an overlay on TravelHerd scripts. Finally, two last points all about TravelHerd invoices. Reservation staff agents also have the option to add personal note to invoices issued by TravelHerd. All invoices issued are stored in the subscribing company’s TravelHerd database and accessed via the proposal or reservation in TravelHerd. Click here to schedule a TravelHerd demonstration for your company.